I really wanted to start this article by taking the piss out of WWE for having the gimmick of the PPV be that all titles in WWE (excluding NXT) are defended, when most PPV's feature all titles being defended because they only have five championships...and then I checked and it's actually been an entire year since all the titles were defended on PPV. Whether that be through design (Brock Lesnar holding the WWE World Heavyweight Championship for a good portion of that time, Nikki Bella sparingly defending her Diva's title on PPV) or sheer coincidence (Daniel Bryan and Ryback's injuries as WWE Intercontinental Champion) it's still pretty cool that WWE have actually come through on the gimmick for the first time in quite a while. Let's have a look down the card and see what WWE could have in-store for us from Houston, Texas. There was dirt-sheet talk and social media buzz that this match wouldn't be going on last, which of course caused quite a stir. Personally, I don't buy into it and seems to be another attempt to get some heat on John Cena (more on that a bit later), because his matches have been fantastic over the last six months and we needed a new reason to hate him. The quality of this bout all comes down to how ready Sting is to main event a WWE PPV in 2015. If his fit and ready, then Rollins is very capable of carrying the majority of the bout, whilst the Icon has a series of flurries of offence to keep things interesting. We saw on Monday Night RAW this week that Sting can potentially go in short bursts, but it's yet to be seen if he can handle a fifteen minutes plus main event style bout. Obviously, the outcome of this match will have a lot to do with the outcome of Rollins' other bout, opposite John Cena. Personally, I can't see Sting walking out of the event with the WWE World Heavyweight Championship, but that doesn't mean that he won't win the match, as we have Sheamus waiting in the wings with the Money in the Bank briefcase. Personally, I can't see Sheamus cashing in at Night of Champions, because WWE has pushed that it could happen way too hard on TV over the last few months, which is usually a sign that the cash in is little way off yet. I'm hoping we see Rollins able to pull a victory out over the veteran, whilst also hopefully setting up a Sting feud for WrestleMania season somewhere in there as well. 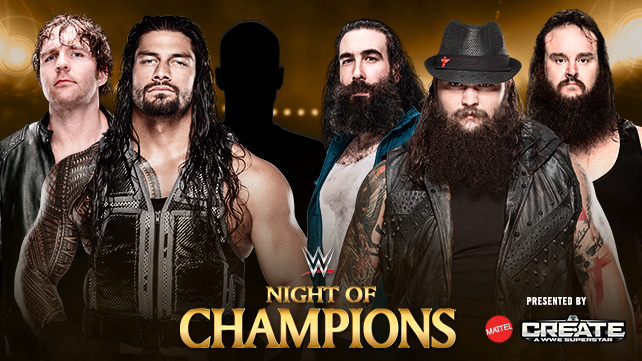 We've seen The Wyatt Family able to get the upperhand on Roman Reigns (and then Dean Ambrose) over the last few months, by simply adding a new member to the group. Part of me thinks that we could see that happen once again at Night of Champions. There's rumours of a Sister Abigail joining the group, although that isn't something I'm particular interested in seeing. In kayfabe, it's hard to look past the Family winning this one, thanks to the fact that they will almost certainly be more familiar with each other than whoever Reigns and Ambrose chose as their partner. WWE's strong push of Braun Strowman over the last month would suggest that we'll be seeing the Family picking up the win no matter what, or at the very least we'll see the big man very well protected in the six man. Can you imagine the pop if Bryan walked out as the third man? If his fit and ready, I can't think of a better choice. I'm hoping for Bryan but I'm not expecting it. A three man would be a good way to protect Bryan upon his return, but I'm not sure having to bump for the green Strowman would do him much good. He's been working a handful of house shows opposite Luke Harper over the last few months and he has unfinished business with Bray Wyatt after their feud last summer, so perhaps Chris Jericho could be the one to step up and join Ambrose and Reigns. He's someone who wouldn't be hurt by letting the Wyatt Family go over and would be more than able to bump around for Strowman. Jericho may be the best option out of the top four favourite guys. Kane (6-1) has been off TV since Seth Rollins attacked him before Battleground, personally I think it would be a waste of his return pop by having him in this match. Cesaro (14-1) is someone who would fit into the Shield, style-wise, but WWE haven't exactly treated him like a star over the last few months. Randy Orton (14) would be a bit of a disappointment after it was teased he was the partner a few weeks ago and then go taken out by the Family. The Rock (14-1) would be a huge moment for the feud and play nicely into the theme of Family, whether WWE would decide not to announce The Rock's first match in over two years, I don't know. Samoa Joe (20-1), Brock Lesnar (33-1), Mark Henry (50-1) and Seth Rollins (50-1) are even more unlikely candidates. I'd be very surprised if we see Seth Rollins walk out with both titles and this match would seem to be the one that he is most likely to lose. The pair had a good match at SummerSlam until the finish, so I'm expecting that this could take the Match of the Night award, pretty easily. It will be interesting to see how Rollins is presented, as he wrestled almost as a babyface at SummerSlam, and with the gimmick of the night, he could easily end up garnering a lot of crowd support here. If that's not what WWE want they will have to be very careful in their booking of this one. I'll throw this out there as well, what happens if Sheamus cashes in his Money in the Bank briefcase at the conclusion of this one? How will that effect the main event? Prediction - Cena regains the United States Championship. How cool has it been to see The Dudley Boyz back in WWE? How cool has it been to watch The New Day recently? Both sides have looked motivated and have bought a new energy and focus to the tag team division, alongside the likes of The Prime Time Players and the Lucha Dragons. I'm surprised this bout wasn't made a tables match, simply because of the focus on the Dudleys using tables all the time. However, maybe we'll get to see a return match with that gimmick down the line. The Dudleys momentum would suggest they're winning the titles at Night of Champions, but I'd expect that we'll see some heel miscommunication that will cost the New Day their titles. Prediction - The Dudley Boyz win the WWE Tag Team Championships. This Kick-Off match actually stands out more than a good portion of the regular PPV card. The new team of Stardust & The Ascension is an interesting one, with the trio all kind of floating around recently, trying to find something that sticks, there's an opportunity for them to become a good mid-card act if they are booked in the right direction. Neville and the Lucha Dragons have had some success since coming to the main roster at the end of March. There is talent here to make this an entertaining opening bout, if they are given the time to perform their best stuff. Their programme hasn't exactly set the world on fire, mainly due to it being pretty stop and start. The two should be capable of working a decent bout, with Owens leading the contest. This needs to be a completely different bout from the matches Owens has had with Cena and Cesaro on PPV, as I don't think Ryback is capable of working that sort of style. This bout needs to heavily focused on the storytelling, and there's a real chance to have Owens working the big bad heel role in this one. Whether the crowd will accept Owens as a heel and Ryback at a babyface in this situation I'm not entirely sure. Owens winning the title may very well get a big face reaction..
Couldn't care less about this match, if I'm honest with you. Ziggler and Rusev have had two matches on TV recently, first the double countout finish at SummerSlam and then a DQ finish on Monday Night RAW...so why is this another normal singles match? Obviously, the plans were heading towards the mixed tag team encounter and then Lana got injured. The strong soap opera style to the storyline hasn't been my cup of tea, and it's made me less interested about all four of the performers involved in the match. The bookies are convinced that Ziggler is going over here, but I'm not sure where that leaves the storyline (which doesn't feel like it's over) to go. The reaction to Nikki becoming the longest reigning Diva's Champion in history was fantastic. Look all over the internet and people were furious. Of course, that's exactly what WWE wanted. Were they particularly bothered about AJ Lee holding the record, I'd guess not, did they know that it would win people up no end? Of course, they bloody did. Did I think the finish was particularly creative? Not really. But the rest of the match was, I thought the pair did a good job in between the ropes. There's an opportunity to put on a better match here. On the Kick-Off show I'd have both PCB and Team Bella banned from ringside and allow Nikki and Charlotte to put on the best possible bout that they could. This PPV has a fair amount of intrigue from me, but it's more to do with the outcomes and potential surprises than it is about being interested in the match card that WWE has put together, if that even makes sense. I suppose what I mean is that I'm more looking forward to seeing how the matches play out, rather than thinking that the content of the matches will actually be that good. I've got a feeling that this PPV will end up being a much better watch live, than it will be when I watch it back on Blu-Ray a few months later.